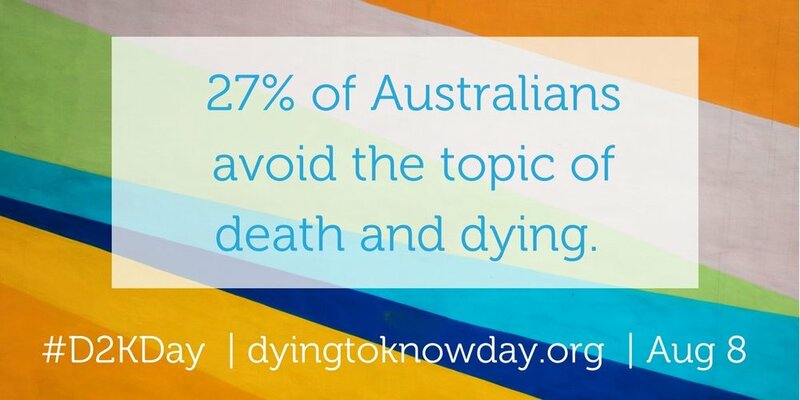 People are getting together on Dying to Know Day August 8th to make Australia a more compassionate place when someone is dying or grieving. D2KDay started in 2013 and this year over 140 community events are being held across Australia. “Everything from small gatherings in the local pub to large events in community centres, film nights, cemetery tours, death cafes and education days have been organised, making Dying to Know Day the nation's biggest community conversation about death and loss”, said founder Kerrie Noonan at The GroundSwell Project. This year Dying to Know Day comes off the back of multiple reports calling for change in palliative and end of life care in Australia. The release of new research from the Caring at End of Life Research team at Western Sydney University (1) shows large numbers of Australians are willing and able to support each other in the face of dying, death and loss. Most notably, 53% feel able to talk to another family member, 63% have sat with someone dying and 47% of us have provided emotional support to a person who was dying. That’s a lot of caring. But we still have a long way to go, with almost a third of us avoiding the conversation about death and only 14% of us having an advance care plan. Only 51% have a will. 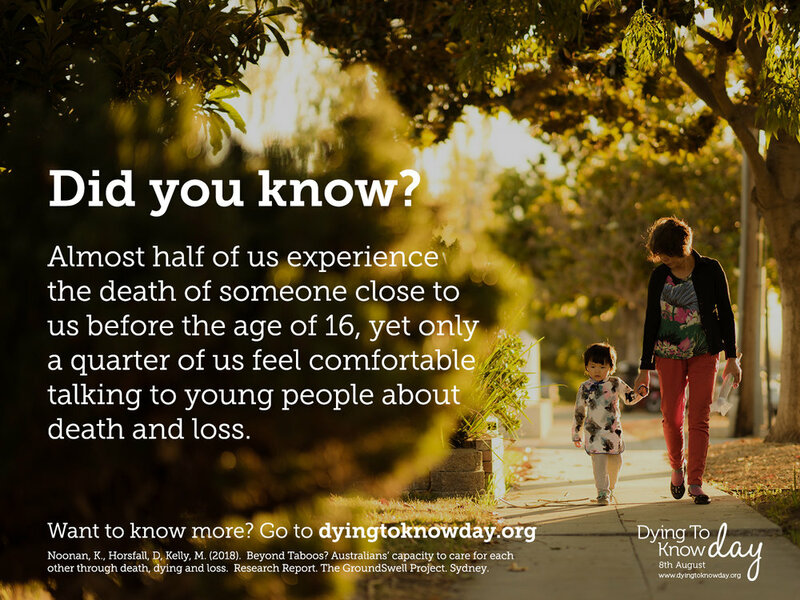 Dying to Know Day events activate conversations and curiosity, build death literacy and help grow the capacity of individuals and community groups to take action toward end of life planning. Over 140 events are happening across Australia. The GroundSwell Project (GSP) want to create a world where everyone knows what to do when someone is dying, caring or grieving. Our purpose is to create a more death literate society, one where everyone has the practical know-how needed to respond well to end of life (EOL). This means transforming conversations into deep community engagement and social action. GSP partners with the philanthropic community, health sector, health insurance and aged care to equip citizens to develop their death literacy. This is Colin’s story about his mother Agnes. 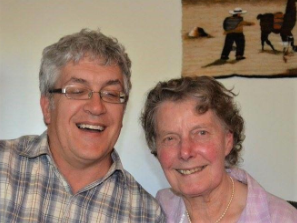 Agnes died at home and Colin shares with us his reflections on death, dying and loss. Many thanks for sharing your story Colin. Last September I took a trip to the Hawkes Bay in New Zealand to see my mum, Agnes McMutrie Jamieson Hunter Weir, (nee Hanna). Born in 1933 in Glasgow, Scotland at the end of the great depression she was a WWII child. No longer having started kindergarten, she was in the war zone; Glasgow’s war machine targeted by the Luftwaffe. From the moment she was born she learnt to fight yet amidst all that, a beautiful woman came to adorn our lives. Out of the air raids and routine trips to the shelters came a woman who cared deeply for children, oozed spirituality from her bones though was not overtly religious and seemed to relish being at the back of the queue watching others served first. She’d been living on her own since my Dad passed away of cancer in 2005. It had been 18 months since she’d popped over to share Xmas with us in Sydney and long overdue some mum and son time. We visited vineyards, ate well, told stories and hung out. She’d been finding it harder to do the day to day things, so we took the time to visit a few retirement villages to see if any of them might be worth a try. We set up some time with the GP to kick off the assessment to determine the level of care mum would need and could be entitled to. After a lovely couple of days we’d made some good progress and it was time to head back to Sydney, promising to check back in when I got back from an upcoming trip. Whilst away, the assessment in October revealed a mass on mum’s liver and in her inimitable and stoic way, she simply declared “it’s not good Colin”. They were the same words she used when she told me of Dad’s cancer, that had him gone 6 weeks later, the interpretation clear. Family holiday to Noosa, a 2 week tour of the US with work, life’s busyness and I was back in “The Bay” in the middle of November to spend a week with mum, initially alone and then joined by my brother. It felt surreal, or maybe that was just my hopes kicking in, separating me from reality. We made great use of the time, visiting more wonderful vineyards, talking about the past and the future and being. My fiancé, Kirsty and I had watched the wonderful movie Wind River before getting on the plane and a scene stuck with me. "I got good news and bad news. Bad news is you'll never be the same. You'll never be whole. Ever. What was taken from you can't be replaced. (sic) She’s gone. Now the good news, as soon as you accept that, as soon as you let yourself suffer, allow yourself to grieve, You'll be able to visit her in your mind, and remember all the joy she gave you. All the love she knew. Right now, you don't even have that, do you? that's what not accepting this will rob from you. If you shy from the pain of it, then you rob yourself of every memory of her, my friend. Everyone. From her first step to her last smile. You'll kill 'em all. Take the pain, Take the pain, Martin. It's the only way to keep her with you. It was time to take the pain. In a few short weeks the cancer had begin its awful work and with significant organ failure mum had become very jaundice and the glow was beginning to go. 6 to 8 weeks, maybe. Its truly awful to watch someone you love so much go through death. It’s so awful, the easiest thing to do is to stay away, get busy, avoid the pain. But as the insight from Wind River tells us, avoiding that pain robs us of their memory, our soul connection and whilst they are still alive it robs them of the people they need most as they go through it and us of the opportunity to lean in and be very present in one of life’s great paradoxes – a fact and a mystery all wrapped up in the same ball of wax. It was during this time that mum talked about her death. She had made the decision that she didn’t want to fight the cancer. Hers was a rare form of “C” and as such there was little experience in dealing with it. The only forms of treatment were brute force chemo and radio therapy as the profession were still struggling to isolate a selective and effective protocol. If the patient was young or strong they might cope with it, even win. But that wasn’t my mum. Brute force radiotherapy and surgery would surely kill her and if it didn’t it would make her last days unbearable. “I’m ready” were my mum’s simple words. She told her GP that she was not going to fight this. She would accept it, just as she had done with so much in life. That acceptance was a gift, she had and shared with all that came to her. As the days began running into each other, inevitable feelings of death and my beliefs popped in and out of my consciousness. With my sister and Dad already taken by the C I’d had plenty of time to consider and reconsider. Again my mum’s views helped: “At least I’m not being taken by a violent finish Colin. That would be awful” I was reminded of the daily news stories of those taken suddenly and badly and agreed with her razor-sharp analysis. Unhappy with her dying I realised I was very happy that I was being given the chance to share it in real time with her, a strange upside from slow deaths. My own spirituality, born of hers, also made me fear less, not fearless but to fear less. Sure I was going to miss her. But to the Wind River point, I was not going to rob myself of her memory by trying to escape from the pain of her death. There is no means of escaping death that we know of. The only thing we can do is make sure we take full advantage of life now so that we can face that moment with accomplishment and comfort. Our previous jaunt around several retirement homes and hospitals also led mum to another conclusion. “I want to do this at home. Can I do that? ” Almost to a one, the institutions were drab, cold and smelt of the end. Thus, a plan was born. “Let’s make mum’s end as fabulous as we can and do it at home” That was inspiring. I was certainly in but where to start? I thought of my good friend Danny Hui, CEO of Sameview who suffered a similar bewilderment when his child was born with Cerebral Palsy in the middle of a shakeup of the National Disability Scheme to decentralise care authority to parents and families. On the surface it is a great idea but leaves thousands unprepared and under skilled for the daunting task ahead. I had also begun reading Jim Collin’s “Good to Great” analysis of the greatest versus the best companies. Both Danny and Jim had come to the same conclusion; start with a great team and go from there. Don’t worry about the answers just yet. Get the right people on the bus and let them figure out where the bus should go and how to get there. First up I called my brother in law Bruce, my sister’s husband. Bruce is one of the smartest people I know, leading a group of scientists helping New Zealand farmers get the most from their land. He had lived near my mum since he and my sister had got together and had come to know my mum as his. He also has a deep spiritual centre. In the interim Bruce had arranged for the nurses at Miranda Smith to give us some night cover whilst I was travelling and have this covered by the local health department. He had scored a couple of free nights and they had done a good job. I did a quick internet search for alternatives, spoke to whoever turned up on the phone to get a sense of ethos, compared prices and asked Miranda to keep going for as long as we wanted. They could provide sleep over nurses from 9PM till 0700. Next up I called mum’s GP. I couldn’t get through to her directly but was able to secure an appointment for as soon as I got back into town. Nicola had been sent from the gods to be smart, compassionate and serve. We hit it off straight away. She was incredibly supportive of mum’s wishes and committed to daily check ins. She was astutely non-committal and non-judgmental when it came to our choices but very supportive. I’d been brought up in a medical family. Between Bruce and I there was no shortage of science and experience with death and cancer. I’d like to think that helped but perhaps only in so far as it gave us both courage, some experience and a good set of questions. Either way Nicola was a fabulous addition to our team and we were glad we had her. We asked Nicola if she thought we could keep mum at home through to the conclusion and if so what were the parameters under which that could happen. Her answer was that in her conversations as with mine, mum had confirmed that she didn’t want to go through with any treatment, that she was ready to go and that she wanted to do that at home. Nicola confirmed that there was no reason that couldn’t happen so long as we as a family wanted it and were prepared to be a very active part of the team. This later part is important and comes without judgement. Death is a very confronting thing for many and encroaches on many emotional, spiritual and cultural boundaries. If we were going to have mum at home, we most certainly had to be “in” Having people wandering in and out of the house unmanaged and unknowing of what was happening would not work. We had to own it. We were in and on consultation with Nicola, enlisted the local hospice, Cranford, who had a mobile service and were able to set mum up with the right meds and delivery protocol at home as well as a hospital bed to assist with the nursing and mums comfort. A normal bed is not made for being in 24*7 and the new beds are particularly well set up to deal with pressure points extremely well. The last point we needed to cover was 24*7. As a family we were happy to be in during the day but after trying a couple of night shifts, soon came to the conclusion that this was very soon going to exhaust us. Fortunately, this was easily fixed, having already found Miranda Smith to do just that. Miranda specialize in in personalised flexible homecare so that those who prefer to stay in the familiar and private surroundings of their own home can have maximum independence yet have access to help as it is needed. Staffed by registered nurses who care about the elderly I can’t praise the girls highly enough. Steph and Di were just astonishing in their expertise and compassion and very quickly became a part of our family for the 2 weeks until mum passed. With this team in place we were set. We set mum up, decluttered the house, filled it with aromatherapy oils, music, orchids and flowers, made it calm and as beautiful for her and us and invited everyone to drop in anytime, asking just that they check in a couple of hours in advance so that there weren’t too many people in the house at one time and mum wasn’t being over whelmed. With the systems in place we moved into our routine, as mum slowly but surely passed away. We cried, laughed, hugged her and each other, read poetry and lived very presently. On December 14th 2017 mum passed away: Cholangicarcinoma. Getting a vision and the plan in place was the hardest. Building a vision for death – how do you do that? Face up to it - Why? Esoterics aside, none of us knew that we could have mum die at home and that it was an option. What do you need? Who do you need? What do we need? We took Danny and Jim’s advice and just started recruiting the team and finding the right people to have around us. Look for that blend of compassion and science that suits you. That Dad had passed away in a hospital 12 years and my sister 10 years earlier helped. We knew cancer. We also knew that having our loved ones in a hospital whilst being safe was not perfect. We didn’t feel as if we could come and go as we pleased and we certainly didn’t feel as if we could be ourselves. I think it also helped that we had grown up around doctors and nurses in the family; comfortable with the science and practice of medicine and an open dialogue around death and dying. I found it tough to juggle busy and being. There is always busyness. So many things to do. We knew mum was dying and that very soon she would not be with us. The most obvious thing to do is to ignore everything and just be with her. At the same time, we were not going to be in her village for long and we were all due to be flying back to our home towns and countries in a very short order. There was so much to be done: estates to be prepared and what seemed like a large decluttering job to be done. All that busy work was also perfectly distracting; distracting from the very real notion that mum was dying. I’m not sure I got the balance right, but I think I got the awareness of the conundrum right, checking in on myself every time I got caught up in busy, asking myself was the busy important to be done now? was I using as a distraction or a break from the emotions filling my blood? Was I ok with that? I inevitably went back and sat with mum. I wish I knew 5 years ago that mum was going to die this summer. Life’s imperfect and we make decisions on imperfect knowledge. We know we should live every day as if it’s our last, spend less time working, or perhaps working more on things we care about more, things more than money, more time loving. I wish I knew that mum’s Xmas in Sydney in 2015 was to be her last trip over. We will never. We do just have to book in the holidays and time with the people we care about regularly while we can. The space of the possible: Caring when someone is dying. Professor Debbie Horsfall has led the Caring at End of Life research team at Western Sydney University for the past 10 years. Over this time they have completed a number of projects about caring at home and what it takes to for networks to come together to care at home. This is a story that captures one of the experiences from the research. Last summer I was in Grafton where the jacarandas and silky oaks were in full bloom and where it had not rained for 8 weeks. The burnt off grass was crunchy underfoot as I walked to meet Gary who was waiting for me on the porch. He was about my age. So was Helen when she died from bowel cancer nine months ago. I have come to hear his story about caring for Helen. The others start to arrive. One of Helens and Gary’s daughters, two work mates, one family friend from school, a hockey buddy, a sister. This is the core group who made it possible for Helen to die at home. These are the people who did the ironing; washed up; delivered meals; showed Gary how to use the washing machine or just gave him some time to himself. These are the people who laughed and cried together and came around for happy hour drinks at the end of each day. They talk about love and sadness. About how they just knew what to do. Or how they stumbled along, showing up, being there and not really knowing what to do or say but coming anyway. Taking the risk. Knowing it was necessary and that Gary couldn’t do it on his own. Knowing that it takes a community, however small, to do the work that needs to be done. There are tears and shrieks of laughter. Emily goes to make cups of tea. I notice how they are still taking care of each other. I leave overwhelmed at what people are capable of. At their willingness to show up and support each other when times are about as tough as they can get. At how this changes them, their relationships, and their communities. And I am reminded of the words of the head of a palliative care unit when I asked him how they support home deaths: we can provide reassurance around the fact that it is natural. Yes, there’s some stuff that’s going to happen that may be confronting but none of it is rocket science ... we can … take them through the steps of what is technically a very simple thing often, but emotionally very heavy and complicated. This is one story of a small group of people who worked, played, laughed and cried together so that Gary could help Helen die where she chose. This was a story of ordinary people doing something quite extraordinary. Notes from the Undertaker – Remember the funeral director works for you! Annette Lourigan is a Location Manager for George Hartnett and Metropolitan Funerals where they feel privilege to be able to help families celebrate and honour the lives and values of loved ones. One of the things I remind myself of every time I sit with a family is – in three months time they need to look back at the funeral service and have no regrets about it, I also share this with them at the beginning of our first meeting. My role when people “contract” me to arrange a funeral is simple – I am to listen and put together not just a personal service, it must be personable. It must reflect the person who has died and their tribe. Always remember - you contract a funeral company to organise the funeral YOU want, not a “cookie cutter version” of their repertoire of varied service selections. Where to start – don’t see the funeral director straight away. In those very early stages of acute grief (and more than likely suffering sleep deprivation) you may find the choices you make over the many options which should be presented to you are reactive and at times costly (in more ways than one). The funeral director before you actually see them can start the required paperwork to take someone in to care and they can make bookings at chapels and churches for you. In your mind and in your families mind put together your idea of how you would like the service to be before you see them. If you are using a crematorium chapel consider booking two chapel times – a funeral service is one of the few times when “buying time” really matters. It allows you to not be restricted to 35 minutes, ensuring that you don’t feel like you are on a funeral factory line as one service is ushered in as the other is ushered out. More importantly it allows you time to physically sit with the person who has died one last time before the actual service starts. Personally I believe more time has greater value than the type of sandwiches served at the wake. Flowers can be very personal, their smell, colour and texture can evoke and create beautiful memories, if you have the time visit a florist and select them yourself. Do it with your family, make an occasion out of it, share the stories of the ‘flower” moments throughout life – Daughters pinning flowers on to their Dad’s suit at weddings, corsages for Debutante Balls and school formals, the first flower you picked from the garden and gave your Mum. From a single flower to a basket of home grown vegetables flowers are more than an ornament on a coffin, they are part of a story of love. In many of the choices you make in life you more than likely consider the costs; for example if your budget allows you to buy a brand new Barina, you are not going to buy a Monaro, to be frank funerals should be approached in the same way. Know your budget; know the options that are available to you. A good funeral director will discuss with you what options are available – if they don’t change funeral directors! A funeral is not just one day in the thread of our tapestry; it is the thread that starts the legacy of life, memory and love. However you choose to celebrate/commemorate a life make it matter, take it from the Undertaker (who is waiting for remission) – life really is too short to live with regrets. Leave to Grieve. How can you take action for D2KDay? Memoleaves was founded by 3 women with a passion to make a difference in the community. Samantha Bladon, a Psychotherapist, Kinesiologist, and End of Life Consultant, Lauren Martyn, a creative media and educational specialist and Yael Naidoo, a photographer and videographer. Their intention is to stimulate reflection, conversation and connection, and finding common ground through sharing stories. Memoleaves.com is a website devoted to sharing your stories about grief and end of life. It is a place where you can go to write about your loss, bereavement and pain to help in your healing process. We are meaning-making creatures and do this by the telling and sharing of our stories. Our philosophy is based on the healing arts, where writing about pain and trauma can help in the recovery process. When you visit Memoleaves you can contribute, connect with others or find services and support. Everyone is welcome. 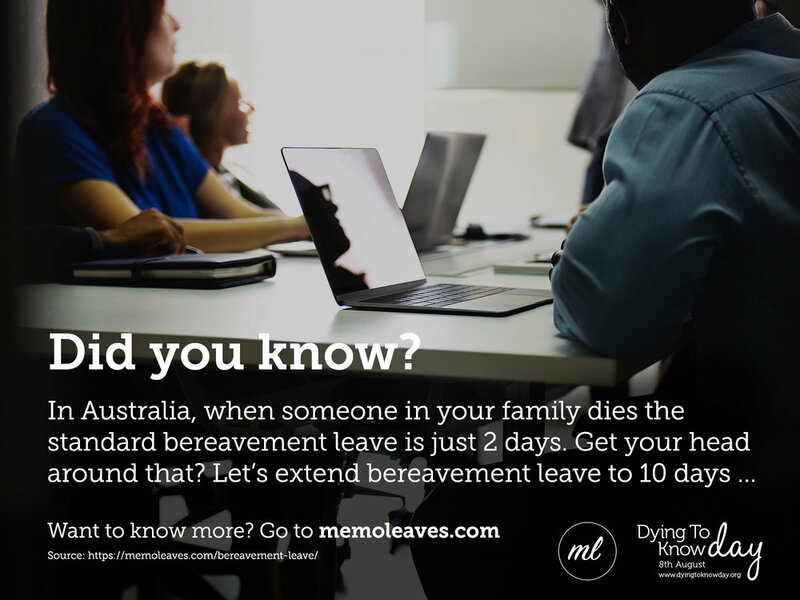 In Australia, when someone in your family dies the standard bereavement leave is 2 days. Get your head around that? We want the Australian Federal Government to extend bereavement leave entitlement from 2 days to 10 days. 2 days is not enough time to attend to our deceased loved one, plan and have their funeral and grieve. That’s why we have started a petition to extend bereavement leave. Approximately a quarter of the population are casually employed, therefore not entitled to other forms of leave. No one should be worried about job security while in the early grief. We are asking for the provision for 12 weeks unpaid extended bereavement leave to be made available within the first 12 months, for individuals requiring extended leave as advised by a GP. Use #leavetogrieve on all your social media comments. Share your story about your loss and grief over at the memoleaves website. We’d love to hear from you. Do you have a stories about an employer who has shown their compassion in leading the way. Tell us a stories about how your employer responded when you needed their support the most. Upload a video to your social media telling us, “I support Leave to Grieve.” Don’t forget #leavetogrieve, or tag @memoleaves. Make an appointment with your local member of parliament or your trade union and tell them why you support Leave to Grieve. Let’s give more time for our loved ones... # Leave to Grieve. We want to live in a more compassionate society. 100% of us will die, and grief is an inevitable companion to death. Knowing about organ and tissue donation is an important part of Death Literacy. In fact, when you #HaveTheChat about your organ donor status, it's a great way to get into the conversation we all know we want to have with our family members! Groundswell and Dying to Know Day are proud supporters of the documentary Dying to Live. It’s a film that takes you into the lives of seven ordinary Australians whose transplant journeys force them to make every day count. While transplant rates are improving, Australia remains well behind similar countries and this film’s brave participants ask why, amplifying a long-overdue debate. Australia is 17th in the world for organ donation... our rate is less than 50% of the world's best, far lower than it should be! The people who appear in Dying to Live are the conduit to uncovering the complex web of reasons why Australians don’t appear to understand the urgency and process of registering as donors. This fearful wait on ‘death row’ not only consumes the patients themselves, but ripples out into their families, friends, colleagues and the wider community. Dying to Live takes the audience on a powerful emotional journey as we are compelled to consider our own compassionate capacity for physical philanthropy. Australia urgently needs more registered donors: many of us don’t even realise that the old system of registering on your driver’s license was abolished in most states, and we now need to sign up via the official website. Despite surveys showing that over 80% of Aussies think it’s important to register, the actual registration rate hovers around 34%. And since less than 2% of Australians die in hospital in the particular circumstances in which donation can occur, we need as many people registered as possible! This shortfall leaves over 1,400 people continually on the transplant waiting list, and 15% of them will die waiting. How much of this problem simply comes down to the necessity of talking about your wishes with your family? Quite a lot! In Australia, your family has the final say about whether your organs will ultimately be donated. 90% of donations go ahead when the donor has officially registered; this drops to 73% if the donor hasn't registered but has remembered to #HaveTheChat with their family, and falls to just 44% if the donor is not registered and their family doesn't know their wishes. In a world where ‘zero wait’ is achievable (as other countries have demonstrated), it’s simply unacceptable, and morally troubling, for us not to offer this chance at life for thousands of Australians living in fear and helplessness, yet always with hope. We are putting the call out to Melbourne groups that could potentially run a community screening of Dying to Live in the future. We have limited tickets to give away for the premier screenings at the Melbourne International Film Festival Aug 14 and the Victorian Premiere on Aug 16. If you reckon you're up for hosting a screening in the future and you can make one of the premier screenings then get in touch with Jessie@thegroundswellproject.com for your tickets! This year for #D2KDay2018 we are inviting people to share their learning and experiences with others. It can be anything - a tip about caregiving, something a friend said or did, or maybe a book or website you found invaluable. Maybe a learning about end of life planning? Some information about funerals or body donation. It can be literally anything. If you are passionate about it... share it! We will compile the responses as part of D2KDay throughout August. Thanks for being part of D2KDay and the death literacy movement in Australia. Here is some great inspiration from the people in La Crosse, Wisconsin via NPR. They are used to talking about death. In fact, 96 percent of people who die in this small, Midwestern city have specific directions laid out for when they pass. That number is astounding. Nationwide, it's more like 50 percent. La Crosse is such an exception thanks to one guy who decided that people in this town needed to make plans for their death. In today's episode, we'll take you to a place where dying has become acceptable dinner conversation for teenagers and senior citizens alike. It's a place that also happens to have the lowest Medicare spending of any region in the country. Read the Transcript or listen below.